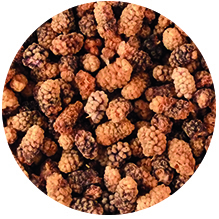 Dried mulberries are treasured for their unique flavour and texture. Also for their antioxidant content, their high levels of iron and protein, and because they are also a very good source of nutrients. Beyond their sweet and delicate flavour, the berry is an excellent source of nutrients including iron, calcium, vitamin C, protein and fibre. They also contain resveratrol, the anti-ageing nutriënt. Recent studies have shown that regular consumption of this special antioxidant may help promote a healthy cardiovascular system. The berry is a satisfying snack, and they can enhance many recipes. Try this sweet, super fruit in trail mix, granola, yogurt, smoothies and baked goods.